On the morning of July 8, 2018 local time, Premier Li Keqiang led a Chinese delegation to pay a special trip to the Chinese Embassy in Bulgaria after the successful conclusion of his visit to Bulgaria and his attendance at the Seventh Summit of Heads of Government of China and Central and Eastern European Countries (CEEC). 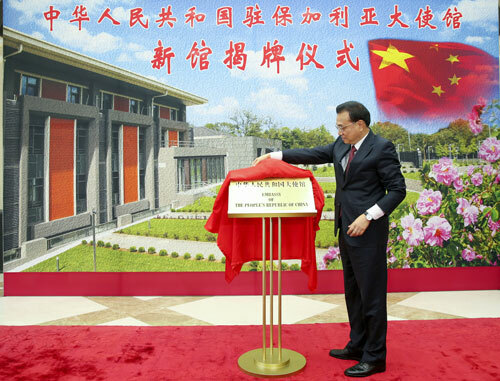 Premier Li Keqiang inaugurated the newly-established premises of the Chinese Embassy in Bulgaria, and sent his messages to the embassy staff. Li Keqiang first conveyed the sincere regards from the Central Committee of the Communist Party of China (CPC), the State Council and the Chinese people to the staff at the Chinese Embassy in Bulgaria and to all the Chinese compatriots working, studying and living in Bulgaria. Li Keqiang said that at the recent Central Conference on Work Relating to Foreign Affairs, Xi Jinping's thought on diplomacy of socialism with Chinese characteristics for a new era was established, thus charting the course for comprehensively advancing the external work in the new era. The completion of the new premises of the Chinese Embassy in Bulgaria represents the great importance the CPC Central Committee and the State Council attached to China-Bulgaria relations and the concern for the comrades. It is believed that better working and living conditions would be provided for the comrades. Staff who are living in foreign countries and working in the frontline of foreign exchanges are blessed with a lofty mission and great responsibilities. It is hoped that all staff would actively devote themselves to the work and continue to make new contributions to the cause of China's diplomacy. Li Keqiang briefly introduced the current situation of domestic development and the outcomes of visiting Bulgaria and attending the Summit of Heads of Government of China and CEEC. He stressed that in the current international situation, the unilateralism and protectionism are on the rise, bringing instability and uncertainty to the world and impact on global economic prospects and trade growth. The achievements of China's reform and opening up over the past 40 years have been made by continuously overcoming difficulties and challenges. It is hoped that the comrades will make further efforts and work hard to implement the consensus and outcomes reached by China and CEEC, so as to add impetus into China-Bulgaria relations, the "16+1 cooperation" and China-EU cooperation, as well as continue to create a favorable external environment for the development of China's reform and opening up. Representatives of Chinese-funded organizations, Chinese students and overseas Chinese in Bulgaria were present.